Kate Hudson covers Allure magazine. Check out her stunning photos ~ CK Jacob: Nigerian Fiction And Lifestyle Blog. 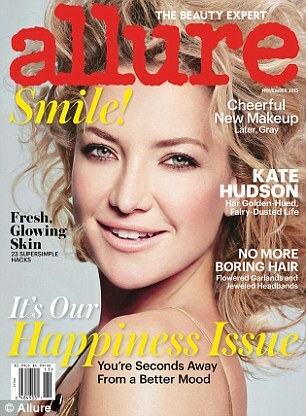 The actress, Kate Hudson reveals the 'insane' way she gets in shape by working out for 20 minutes a day. "People think you need two hours a day to do it, and that's bullsh**," she tells Allure magazine. "If you work out 20 minutes a day in some way, you're going to see changes." And while she does work on her body with professional trainers, Kate will fit in whatever exercise she can. "I've had days where I have the kids - Ryder's on his bike, and I put Bing in a stroller - and I will run and sprint up hills," she said.